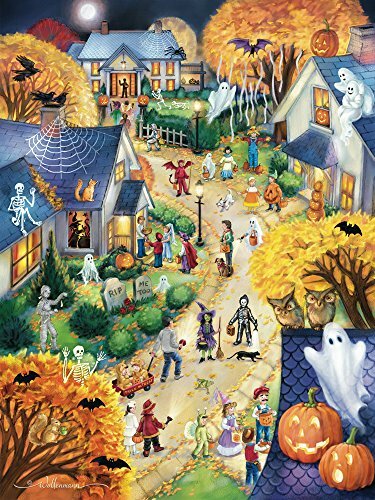 Halloween puzzles are perfect for building the anticipation to this popular holiday. All of our signature jigsaw puzzles are made in the United States with recycled materials. Fully interlocking and randomly shaped pieces make for a pleasant puzzle building experience. Each jigsaw puzzle is produced on thick, quality board perfect for mounting and framing. This puzzle includes 550 pieces and measures 18"x24" when completed. Artwork by Randy Wollenmann. A fun Halloween puzzle the whole family can enjoy together.